IOur campaigning team working on Cycle Superhighway 4. It’s finally here: Transport for London have opened consultation on Cycle Superhighway 4 from Tower Bridge to Greenwich. And it’s looking good. Give us a friendly wave. This is a very well-designed scheme. Looking at the sections in Southwark, you will be able to cycle on a continuous 2km bidirectional cycle lane, 3-4m wide. And it will be both convenient and safe. More information on how CS4 will look from the point of view of pedestrians and bus and car users is on our CS4 pages, or click Campaigns > Current consultations. This will provide information useful if discussing the scheme with non-cyclists. There will be only 4 stop lights as Abbey St will now have cycle bypass, as will the Rotherhithe Tunnel roundabout. All major junction crossings will be safe for everyone from kids to pensioners – no need to be fast and brave. Cycle priority at all 10 minor road junctions – just like the motor traffic lanes on the main road. There are 15 pedestrian crossings of the cycle lane. In places, these will require people cycling to slow or stop. But with current pedestrian numbers, we don’t expect you to meet people crossing often enough to delay your journeys. Routes like this which are both convenient and safe to cycle on throughout allow people to cycle who previously never would, and transform a daily battle into a joy. I would know, because my commute is along Cycle Superhighway 6. This was a commute that I’d tried cycling once before, and then never again after such a terrifying and stressful experience. Now I cycle there every day, and love it. As part of a separate consultation, there will also be an excellent link from CS4 to Quietway 14 via Tanner St, including bidirectional segregated cycle lane on Tanner St between Jamaica Rd and Druid St. Separate post on this to follow. 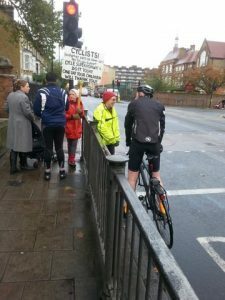 Go to the London Cycling Campaign website at http://lcc.org.uk/cs4 to see the sections we think are most important to respond to. You can also read our CS4 pages (under Campaigns, Current Consultations). We’re really excited about this scheme. Please respond in support of it!